It seems like I’ve been on a Strawberry kick lately. I’m not sure if it’s Spring Fever or the great price they have been lately at the store. 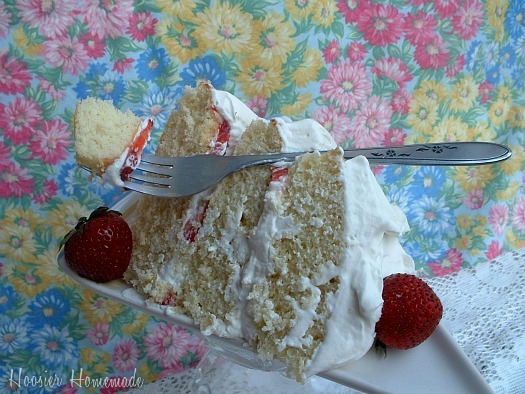 This Fresh Strawberry Layer Cake starts with a recipe that comes from Susan Branch and her Summer Book, it’s a wonderful white layer cake that can be used with many different toppings, frostings or even made into cupcakes. Cream butter and sugar, until fluffy and well combined. Add egg yolks and beat until thick and lemon-colored. In a seperate bowl, combine dry ingredients and mix slightly with a fork or whisk. Add to the creamed mixture, alternately with milk. Stir in vanilla. Beat egg whites until stiff peaks form. Fold into batter, gently. For the Layer Cake, divide batter into 3 round cake pans, that have been sprayed and lightly dusted with flour. Bake at 350 degrees for 20 minutes or until a toothpick inserted in the middle of the cake comes out clean. Note: This cake can also be made into a 13×9, cupcakes, or any size pan. You will just need to adjust the baking time. For the topping, I used 1 pint container of fresh whipping cream, beat until stiff peaks form, add a dash of vanilla for flavor and about 1/2 cup of powdered sugar. Beat well. Slice fresh strawberries. 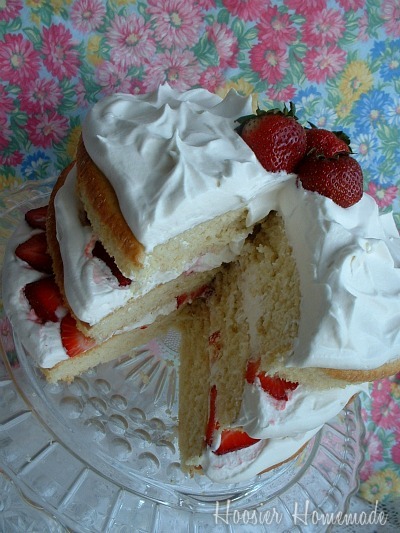 Remove cake from pan and place on serving platter, top with whipped cream, then strawberries, repeat for all layers. Picking strawberries or buying them at the store when they are on sale is a good thing. Freezing them to use later is even better. Erin from $5 Dinners shows you how to freeze them to use later in smoothies, muffins or even pancakes. So tell me, have you found strawberries on sale this year? Or maybe been lucky enough to pick some? May I have a piece of that deliciousness now? Pretty please? I don’t look for strawberries on sale. I grow my own. They are so much better when you get to pick them at the height of flavor and you know there are no pesticides used to grow them. What % of milk works best? Also 1 pint container of fresh whipping cream-how many ml would that be and you mean like the 35% whipping cream? Oh my, this looks so good! I can’t wait for strawberry season! Bookmarking this until then. VIsiting from Funky Junk. Thanks for this beautiful idea. I’m going to make this tomorrow for my son’s first birthday. I didn’t want “the usual” birthday cake with tons of sugary frosting to amp up a bunch of toddlers, and my little guy loves strawberries. I remembered this photo with the simple layers of cake and fresh whipped cream and berries. We are so looking forward to it! This looks so good! I love anything that has strawberries in it, so I will have to try this cake! I love this cake! It just has me dreaming of Spring!!! I just love the combination of vanilla and strawberry and this looks simply fabulous. I made this cake 3 or 4 time last year. It was a hit everywhere I took it… church, a picnic, dinner with friends. Best.cake.ever. Truly yummy!!! This looks like a giant strawberry shortcake. Love it! This sounds like the perfect cake to welcome spring! YUM! I love strawberries, too and can not wait to try this recipe. It looks delicious, Liz! This looks so pretty! I showed hubs and he said, “you should make one!” I’ll try but it wont look like that 🙂 great job! Thank you so much! Your work is gorgeous…I’m sure it will be great!! Your cake looks yummy and just says Spring time to me. Looking forward to trying it.